runstar Free - Run like the wind! At last—spring is here. All the runners out there are reveling in the fact that they can start running along their favorite routes again. If you’re a runner and take a certain amount of pleasure in aesthetic refinements then runstar Free may be the app for you. Even though this is a preliminary version of the app, the design is out of this world, I’m not kidding. But whether the app’s functionality is already up to par… that’s what I’ll be reviewing in today’s test. runstar Free allows you to chronicle your tracks via GPS and revisit them once you’ve arrived at your destination. Thanks to Google Maps Integration this is a completely effortless endeavor that runs very smoothly (if you’ll forgive the cheesy pun). At the moment, you can still only find Free run under the selections menu. This mode allows you to record your route, which is a feature you might already be familiar with from other GPS trackers. Before tracking begins, you have the option of running runstar Free as a MP3 player throughout the duration of your training. The MP3’s functions are relatively basic up until now. For instance, it isn’t (yet) possible to choose which songs you want to hear and which ones you don’t want to play, which means that every track you’ve installed on you Android phone will either be played consecutively or shuffled. 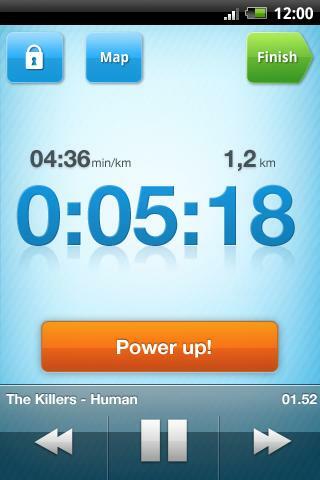 One neat feature is the Power-up song, which you can select for especially challenging legs which you feel require an extra dose of motivation. After a brief moment during which the GPS signal is located, you can begin with you training session. You can influence song selection when you’re in this training mode: you can pause during playback and skip to the next track or back to the previous one. The track’s title is also displayed. And you are, of course, given an overview of how long you’ve been running, how many minutes you need to run a mile, as well as how many miles you’ve covered thus far. The last two points are displayed in a practical diagram. You’ll find all the sessions you’ve completed under Results. You can choose whether these should be displayed by month, year, or as an overall view. The distance you covered for each period will be displayed accordingly. Furthermore, you can review each individual session and revisit all the details that are shown immediately after you finish your run. The Goals tab is also quite useful. This is where you can enter your desired overall distance covered for the month. runstar Free already has a lot more to offer than other GPS trackers, like the integrated MP3 player, as well as giving you the option to spur on your motivation by entering an overall distance goal you want to try to cover in one month. But what is clearly still missing is the option to view Google Maps whilst running. You’ll find out which functions you can expect from the upgraded versions of runstar Free the first time you use this app. The final version will allow you to try and beat your own record in respect to time, distance, and speed. Furthermore, you’ll have to option of entering several motivational goals. The app’s design is clearly what will catch your attention. It’s very sleek and elegant—a true beauty amongst the other apps. The developer’s really pushed the envelope and came up with a truly awesome looking app. Aside from that, it’s easy to use. Another positive point is that you don’t have to deal with a menu button. runstar Free ran very smoothly on my HTC Desire, but my G1 struggled quite a bit. First generation devices may experience a few bumps and jolts. The app didn’t crash during the testing phase. runstar Free can be downloaded for free from the Android Market. 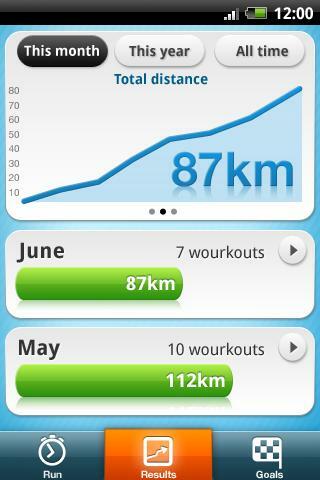 Step by step, at an alert or slower pace, you have statistical information on your physical activity. You can then set a daily, weekly, monthly, or annual general statistics on the performance you are tracking or wanting to improve.